Introduction: In a shocking turn of events, the New York Giants have waived Davis Webb who was projected to be the heir apparent successor to Eli Manning. Originally, the Giants kept all four quarterbacks on the roster on the final 53-man roster; which caught many off guard. Then after claiming six players off waivers, the Giants decided to cut one of their quarterbacks; which many believed to be Alex Tanney. 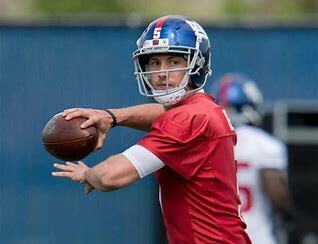 Instead, Davis Webb drew the short straw and was released. Webb performed well enough in the pre-season to secure a spot on the roster; or so we thought! Webb finished with the most yards (283) no interceptions and a respectable 52.8% completion rating. Unfortunately; it wasn’t enough for the 3rd round pick in 2017 to secure a spot on the roster. Earlier reports had the Giants attempting to trade Webb without success; which eventually led to his release. Many are speculating that Webb was released because he was drafted by the old regime in Reese and McAdoo, perhaps there could be some truth to that as other Reese/McAdoo draft picks over the last couple of years have also been released such as: Darian Thompson and Avery Moss. Regardless; if no one claims Webb off waivers, it would make sense for Gettleman and Shurmur to place Webb on the practice squad; which they currently do not have any quarterback projected. Whether they decide to take that route is highly unlikely. Final Thoughts: The Giants have claimed six players of waivers; which includes three cornerbacks. The top two that could help and potentially be solid additions to the Giants are Mario Edwards (DE) and Spencer Pulley (OC). Edwards was a 2nd round selection in 2015 by the Oakland Raiders and could the opportunity to help the Giants as the 6’3/280 pound defensive lineman is still only 24 years old. Pulley started all 16 games for the Chargers in 2017 and played in all 16 games as a rookie in 2016. Evan Brown is the only true center on the roster and he is a rookie (UDFA) and Jon Halapio is a rookie in terms of learning a new position at center.